The Dunlop MSA British Touring Car Championship today confirmed a record entry list ahead of its 2011 season with the highest number of different makes and car models entered for the series in the two decades it has run as an all two-litre formula. Ten makes of car representing Audi, BMW, Chevrolet, Ford, Honda, Proton, SEAT, Toyota, Vauxhall and Volkswagen will all feature on this year’s flourishing grid. Out of those, 13 different models will be gearing up for action including: Audi A4, BMW 320si, Chevrolet Cruze, Chevrolet Lacetti, Ford Focus, ‘Global’ Ford Focus, Honda Civic, Honda Integra, Proton Gen-2, SEAT Leon, Toyota Avensis, Vauxhall Vectra and VW Golf. This beats the previous record (nine makes and 11 models in 1993) seen in the BTCC’s two-litre era that began in 1991. In total, 27 entries have been received for the 2011 season, the first event of which is staged at the Brands Hatch circuit in Kent in ten days’ time on Sunday 3 April. From there the title race will head off on a high-speed, action packed, six-month tour of the UK, with ten race events in total at nine different motor sport venues culminating with Finals Day, this year being staged at British Formula 1 Grand Prix venue of Silverstone, Northants – host of today’s Media Day season launch – on Sunday 16 October. Notably, the Audi, Proton and Toyota entries are all for cars built to the BTCC’s dynamic new Next Generation Touring Car technical regulations which provide dramatically reduced costs and have led directly to four new teams alone joining the BTCC for 2011. Official ‘factory’ teams from Chevrolet and Honda also star on the entry list, while Toyota GB are funding an engine development programme for customer teams running its Avensis to the new NGTC regulations. Further underlining the BTCC’s importance to manufacturers as an ideal sporting arena in which to showcase products, the Ford Motor Company has chosen the championship to debut the competition version of its new 2011 Focus model, in the hands of the independent Team Aon squad. In 2011, the BTCC will once again receive unrivalled levels of television coverage – both live and highlights – across the ITV network. Its ITV4 and new ITV4 HD channel will be broadcasting ‘all-day live’ at the ten BTCC events with highlights on both ITV1 and ITV4 in the days following. In addition, the Goodyear-Dunlop group will continue as the championship’s title sponsor through its high performance Dunlop brand. It will be at Dunlop’s Tyre Fort headquarters in Birmingham that every one of the 5,000 or so tyres supplied to teams in this year’s BTCC will be manufactured. For the British public, the BTCC will also continue to offer unrivalled value-for-money entertainment when compared to other premier sports with free admission for children at every event and tickets for adults costing from as little as £23. Admission includes meeting the BTCC’s star drivers during pit lane autograph sessions plus, at most events, open access to the paddock. 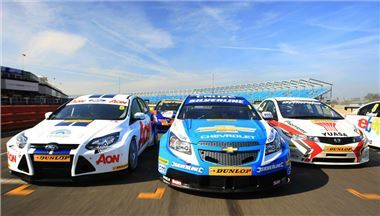 BTCC Series Director Alan Gow commented: “I’m very, very proud about the way our 2011 season is taking shape. The fact our entry list includes ten different makes and 13 different models of cars – a record for the BTCC in the two-litre era – in what still remains a challenging financial period is, quite frankly, incredible. The BTCC is (by far) the most watched form of national motor racing in the UK – and for us to continue to reach new heights is terrific news for British motor sport as a whole. Full credit must go to all of our teams, drivers and sponsors for their incredible commitment. “The increasing participation by new teams and the involvement of motor manufacturers – whether as official factory teams or ‘behind the scenes’ – is a ringing endorsement of the championship’s appeal. As is the presence of an increasing number of major high street brands who, more and more, are choosing to market their products in front of our millions of TV and trackside audiences as either championship or team sponsors. The BTCC’s ‘bang for buck’ rivals and perhaps tops anything that any other major sport can offer in this country. “It is important to be mindful that 2011 is both the beginning of a new era and of a transitional period - with the previous breed of Super 2000 cars and the newer NGTC (turbo) machinery being able to fight on an equal footing for the next two seasons, it will make for a fascinating fight. ITV's unrivalled coverage of the Dunlop MSA British Touring Car Championship will extend even further in 2011 with, for the first time, all ten of the season's qualifying sessions being shown live on the network's itv.com website. The UK’s largest commercial television network already provides the BTCC with what is by far the biggest TV coverage in UK motor sport. Its 2011 coverage will again include seven-hour-plus live broadcasts from all ten race events on both its ITV4 and new ITV4 HD channels – plus 60-minute highlights on both ITV1 and ITV4. However, ITV has today also confirmed its live online broadcasts of Saturday’s all-important half-hour qualifying sessions that decide the starting grid order for the first of Sunday’s three BTCC races. This is on top of itv.com’s already-strong BTCC content that includes live-streaming of ITV4’s race day coverage plus a library of race highlights as well as dedicated news and podcasts. Broadcast times on ITV1 and ITV4 will be announced soon – more information will be provided via the official btcc.net website’s ‘Calendar’ section.